A lawsuit filed against the state of Minnesota by two of its licensed wineries had a hearing last week in the Eighth Circuit Court of Appeals. The suit is a constitutional challenge to Minnesota’s Farm Wineries Act, which requires licensees to use 51 percent in-state grapes. Alexis Bailly Vineyard and The Next Chapter Winery sued Minnesota’s Department of Public Safety in 2017, claiming the 51 percent quota impedes their constitutional right to conduct interstate commerce. The case may have implications in other states where winemakers have a statutory fruit content requirement. Nevada imposes a 25 percent in-state fruit quota after the first 1,000 cases. A lower court upheld the Minnesota requirement last year, on grounds that the wineries could opt for a different kind of license with no content restrictions. The alternative to the farm wineries license is a manufacturer’s license, which would allow the winemakers to use grapes from anywhere, but would prohibit them from selling wine by the glass in their tasting rooms. Cavanaugh said the ruling doesn’t take into account the plaintiffs’ business model. 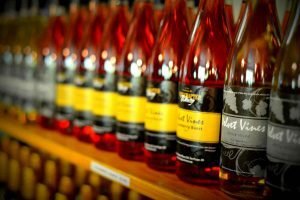 The farm wineries are tourist destinations that depend on direct sales to visitors. Minnesota law allows wineries to apply for a one-year exemption from the quota when the supply of in-state grapes is limited. The application is filed in the year the exemption is needed. This seeming concession just complicates the management task, Cavanaugh said. “No business plans on a 12-month cycle alone, and luckily the judges at the Eighth Circuit seemed to recognize that,” she said. Beyond the business issues, Cavanaugh said the judges were “tuned in” to the constitutional question. The state’s attorney argued that the wineries have no standing to sue, because they’ve never been punished for violating the grape quota. Cavanaugh dismisses the argument. Cavanaugh works for the Institute for Justice, a nonprofit law firm that represents small business in select cases where constitutional issues are involved.